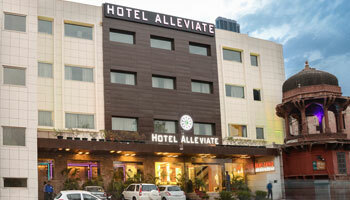 Hotel Alleviate, Agra a 45 key, Luxury Hotel located just 2 km from the magnificent World Heritage “The Taj Mahal “ , welcomes its guest to experience an artful balance of contemporary elegance and modern design. Newly constructed throughout from the splendid lobby, newly well appointed rooms including 12 Standard, 15 Deluxe, 16 Taj Facing, 2 Suite Rooms and Banquet Space, the hotel offers first theme based restaurant in Agra named “Filmy Zayaka”. Bar and Conference Hall along with impeccable service, are opening shortly. We are further geared to recognize the distinctiveness of Luxury Travelers and we take pride in offering a personal, an efficient and competitive service, at any time. Whether your stay is for business or for pleasure. Room Service, Breakfast Services, Currency Exchange, Travel Counter, Security Guard, Airport Transportation, Laundry Facilities, Parking, Doctor on Call, Backup Generator. Iron/Ironing Board, Cable/Satellite TV, House Keeping, H/C Water, Attached Bathroom, Air Conditioning Room, DVD Player, Wakeup Calls, Toothbrush/Razor on Request.